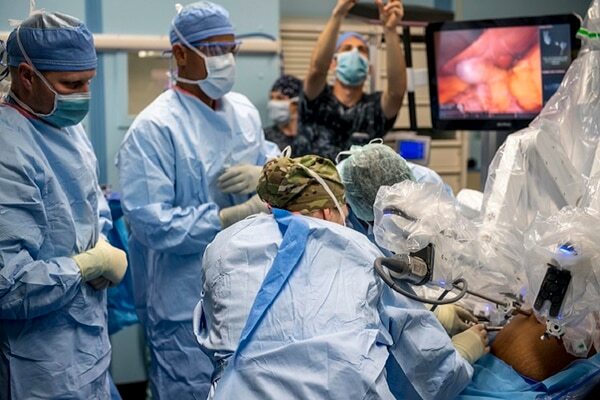 The surgical staff assigned to the Navy hospital ship Mercy, alongside partner surgeons from Sri Lanka, completed the ship’s first ever robot-assisted surgery on May 4. 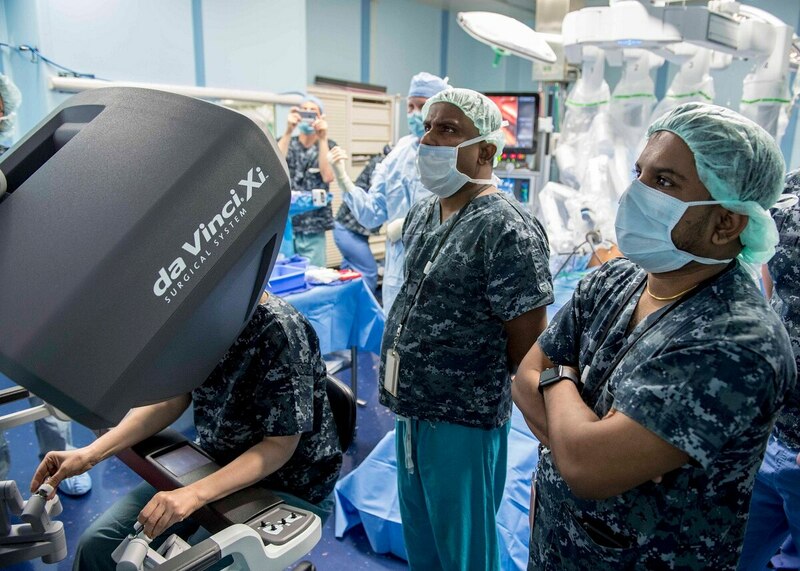 Using the Da Vinci XI Robot Surgical System, the multinational surgical team removed the gall bladder of a Sri Lanken citizen, marking the first time the Da Vinci Robot has been used on a living patient onboard a ship from any country, a news release said. The Da Vinci robot is a minimally invasive system that allows surgeons to operate through only a few small incisions. After the insertion of a high-definition 3D camera, surgeons control robotic arms that employ tiny instruments that bend and rotate into positions the human hand is incapable of, allowing for greater precision and control. In performing the ground-breaking procedure, preparation between the partner nations was critical. “This surgery took a lot of planning before we actually performed it aboard the Mercy,” said Navy Cmdr. Tamara Worlton, a surgeon from Walter Reed National Medical Center currently assigned to Mercy. Sri Lankan surgeons had to prescreen candidates prior to the Mercy’s arrival to ensure the surgery went smoothly, Worlton added. “I believe the surgery was a success because of the continuous collaboration between our partner nation’s medical staff prior to the surgery, where we discussed different surgical techniques the different countries do and how it could be incorporated,” Worlton said. For the lead Sri Lankan surgeon, Dr. Vyramuthu Varanitharan, the surgery was the first he’d ever performed aboard a ship. The operating environment onboard Mercy surprised him significantly. Once the procedure was complete, the patient was moved to post-anesthesia care onboard Mercy and was later discharged from the ship “in excellent condition,” the release said. “It was an exciting experience, and I am thankful for the opportunity to have been a part of this ground-breaking moment for the surgical field,” Gadbois said.